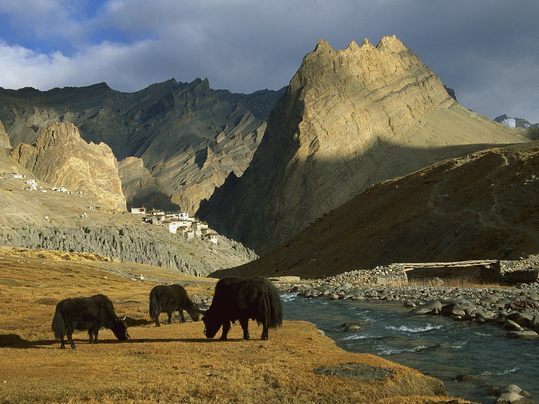 If you want to trek in Ladakh, there wont be an easier trek than this one. Passes below 4000 meters and the distances short following a former trade route north of the Indus Valley. Chances to stay in homestays and can be converted into a safe family adventure, where children and adults can ride ponies all the way. Also called Sham Trek it's a full fledged laid out road with a little traffic although there are shortcuts which can be taken to save time and get lost in wilderness. one passes through several villages and its worth visiting the monasteries of Likir, Ridzong and Tingmosgam on the way. Likir is 1.5 hours drive from Leh, so we can always start early after a day or two stay in Leh for acclimatization. This is the trek that can be done throughout the year, as the passes are not very high and don't get snow-blocked during the winter. There's Likir Monastery and Gyabcho Guest House with pleasant gardens and attached baths. Likir Gompa was founded in 12th Century. After a fire accident the Monastery was re-built in 18th century with beautiful images framed in wood carvings which makes it a worthwhile experience. One gets to see the ancient spiritual monasteries and pleasant landscapes. After a pleasant acclimatization stay in Leh, Next morning we will head towards Likir which is a small distance from Leh. We visit Likir Monastery and enjoy the blissful experience enjoying looking at the paintings and scriptures as well as admiring the architecture and magnificent thangkas. From here we follow the road up over the first small pass Chagaste La (3700 meters). The trek is surrounded by wheat fields and has beautiful views and scenery. From there we will take a road up towards Phobe La (3580 meters) , we will come across Saspotse village in the way after crossing a small stream. In an hour we will reach Phobe La, where we will enjoy beautiful views of Yanghtang Village. From there we descend towards Yangthang village as we stay here tonight. From an hours trek to Yangthang there is Rizong Monastery, a quite 100 years old structure situated in seclusion nestling in a gorge which houses a beautiful amphitheater and around 40 monks. The monastery is also called “the paradise for meditation” and is noted for its extremely strict rules and standards. After visiting the gompa, we ascend gradually to the Shushut pass 4000 m. From the pass we have a view of Hemis Shukpachan as well as surrounding peaks. An easy descent towards our camp at Hemis Shukpachan takes a couple of hours. It is one of the major villages of Sham, and the name of the village is derived from the grove of cedars (shukpa= cedar or conifer). 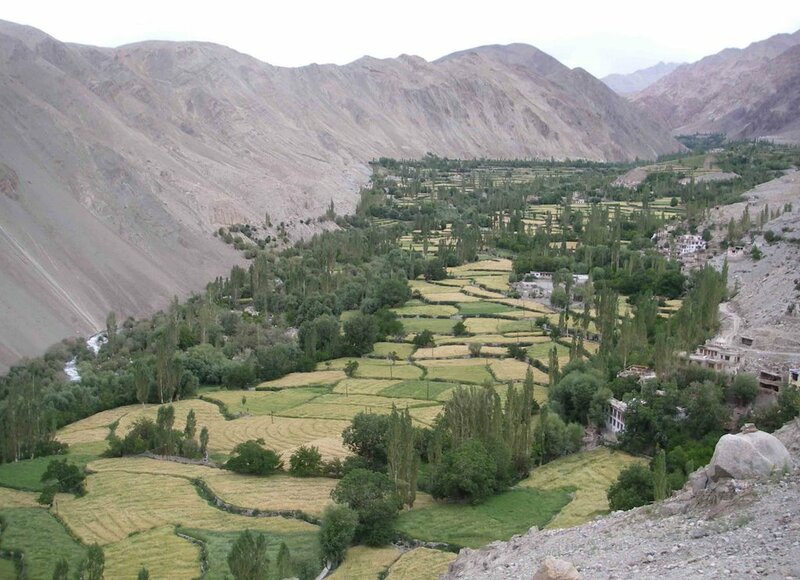 It's one of the prettiest village of Ladakh housing sparkling streams surrounded by shady willows and large barley fields adding the dash of green much needed in the barren and rocky landscape. We Camp overnight at the village. From Hemis Shukpachan we go onto a flat ground as far as ill-defined pass alongside the stupas. A steep descent will lead us to the right side of the mountains and climb steadily on the slope towards the Mebtak La (3720 m). After taking short rest and enjoying the view from the pass, we head down to the village of Ang. We have to cross a watercourse and reach Tia village. Trekking further, we will find the village of Temisgam. Temisgam is well famed for its monastery, and is perhaps the most affluent village in the sham valley for its apricots, apples, nuts and beautiful houses. Camp overnight at the village. After a night at Temisgam, we drive to Lamayuru. An early morning visit to the Lamayuru monastery is mesmerizing. All of us can choose to enjoy the morning rituals. A drive back to Leh through the scenic villages of Rizong, Alchi, Basgo, Phyang & Spituk would definitely make our day. 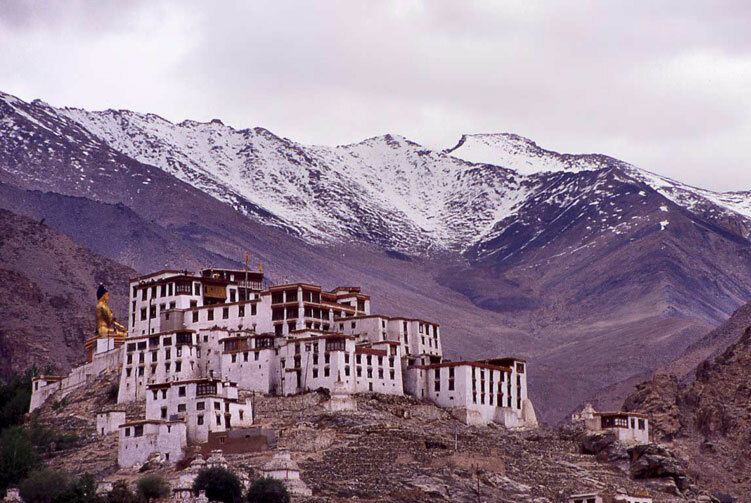 The famous monastery of Lamayuru (one of the oldest monasteries of Ladakh). Visit the Yurdung Gonpa(another name for the Lamayuru monastery), and enjoy the scenic view of the moon-land (landscape similar to that on moon). Overnight stay at hotel in Leh.